Since moving to Australia in January, I’ve been cutting myself lots of slack – not writing much, wandering around Sydney city streets, exploring new shops, cafes, meeting new people, making friends, and in general roaming about to places close to my living quarters, even when it’s raining. It amazed me when I thought about it today. So much time has passed! Work and travel do keep me busy. Thought I’d share something of my travels here on the blog. Previous travels since January will come in later, when I have time to consult my diary and type things down here, but for the moment, I’ll share our travel to the Blue Mountains yesterday. I think one day I shall buy a house in the Blue Mountains. Anyway, so yesterday we decided to go to Katoomba. 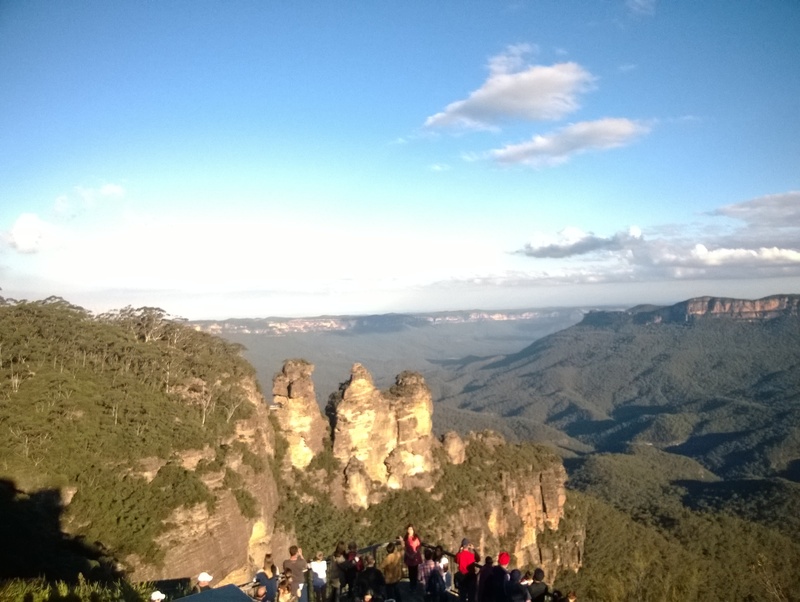 A well-known tourist spot, Katoomba is famous for the Three Sisters. It’s also well known among trekkers and bush walkers. After catching a train from Sydney Central, we reached the Katoomba Railway Station, enjoying lovely scenery on the way. The journey takes a little more than 2 hours, but is well worth it, especially for those who have no car and wish to do a budget travel. The train ticket costed only $11. Getting out of Katoomba Railway Station, just across the road is “Blue Mountains Explorer Bus” or as they call themselves; Hop-on Hop-off Bus Tours. We caught on of those buses, though it’s a kind of expensive proposal. They charge $40 per person. However in the long run, I think it’s worth it since you have pick-up and drop from every touristy place in Katoomba. They even guide you on what to visit most especially, if you’re short of time. The bus took us on route to Katoomba falls, after touring us around Narrow Neck lookout, Landslide Lookout and then dropping us to Cliff Drive. We decided for a walk from the Kiosk to the Katoomba (Kedumba in Aborigine language) falls. At the Falls Café, we enjoyed an average Aussie burger with chips and lemonade. Not really a good burger but quite alright. I wouldn’t complain, although I think bringing your own picnic food is a better idea. There are benches outside where you could sit and enjoy your food. A hot cup of coffee is very welcome since it’s quite cool outside. After all, it is Autumn! So, via the Cliff view lookout, we went down to the bottom of Furber Steps and to the base of the Katoomba Falls. Then came the turn of The Echo Point and The Three Sisters. We trekked our way to the Echo Point from Honeymoon Point, to gaze at the Three Sisters. The story of these three hills is quite interesting. According to Gundungurra dreaming, three beautiful giant sisters named “Meehni”, “Wimlah” and “Gunnedoo” once lived with the Gundungurra people in the Jamison Valley, Blue Mountains. The maidens were in love with three brothers from the neighbouring nation of the Daruk people, but marriage was forbidden by tribal law. The brothers were warriors and decided to take the maidens by force. Tribal war forced the Kuradjuri (clever man) of the Gundungurra people to turn the sisters into stone. He intended to restore them after the danger had passed and the war had ended. Unfortunately, the Kuradjuri (clever man) was killed in the in battle and to this day nobody has been able to break the spell to turn the Three Sisters back to their natural form. Finishing all places to see in one day is I think, quite impossible. By five in the evening, buses are ready to drop you off to the station from your location. And it was biting cold by evening, enough to warrant a sweater and a jacket. Before we left though, we found a charming small house where they were selling home made jams and honey extracted from their garden. We bought some and were off to the railway station. Trains are every hour until mid-night.